Green Project: Designed with a goal of achieving LEED Silver Certification. 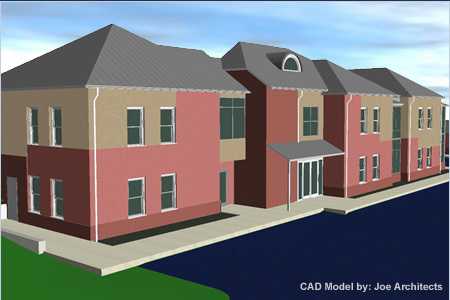 Structural, mechanical and electrical engineering services for a new two story office building and a detached maintenance building for a public housing agency in the City of Rockville, Maryland. The building was designed with a goal of achieving LEED Silver Certification. Structural, mechanical and electrical engineering services for a new two story office building and a detached maintenance building a public housing agency in the City of Rockville, Maryland. The architectural drawings consisting of floor plans, elevations, reflected ceiling plans, sections, details and specifications were prepared. The uses of the many sustainable items were incorporated in the design with a goal of achieving a LEED Silver certification. The civil drawings consisting of the site plans, storm water management plans, sediment and erosion control plans, profiles and details were prepared for the entire site including the building and the parking lot. Provided topographic and boundary surveys. Prepared responses to the review comments as required by the local governmental agencies and obtained approval for issuance of various permits. Provided a forest conservation study and documents in order to limit the disturbance of existing trees and provided new trees for replacement of all affected trees as required by local governmental agencies and obtained approval. Structural engineering services for the design of a steel framed structure primarily with steel joists and concrete floor at the second level and pre-engineered pitched wood roof. The exterior walls consist of light gage steel bearing studs and the rear wall at the first floor level includes a reinforced concrete masonry basement wall. The foundation system consists of shallow spread concrete footings. The HVAC system consists of six gas fired roof top units. Two constant volume roof top units serve the conference and multipurpose rooms. The remaining four constant volume roof top units serve the open office space, individual offices, break room, conference room, etc. Each zone of the four roof top units was equipped with modulating damper which was controlled by their respective space thermostat. A main bypass damper was provided between the main supply and return duct of each roof top unit. Electrical engineering services included sizing the new electrical service, lighting design for exterior parking lot and interior areas, power distribution system, communication, data, fire alarm system.